The citadels of Mdina and Victoria, and Valletta, are possibly the most impressive with their huge fortifications. A must when you're a small vulnerable island. The Sliema and St Julian's area is a lot more modern and built up - lots of hotels (some much nicer looking than others), shops and bars/nightclubs. A stroll along the front at Sliema was basically half a mile of being hassled to go on a cruise around the two harbours, which was a bit off putting. Until that point I had been considering it..
Malta is a very catholic country. You'd struggle to walk more than about 10 metres in any of the towns without seeing a church, shrine, or other miscellaneous religious stuff. Both Mosta and Xewkija (on Gozo) claim to have the third largest unsupported dome in Europe. At least one of them is lying - both are huge and dominate the skyline, but Xewkija is bigger by volume, although taller and skinnier which I think is where the confusion comes in. Mosta had a bomb go through it but not explode in the war, which was obviously a miracle rather than just dodgy munitions... ahem. Anyway, lots of churches. I didn't go inside any - partly because I am a dirty heathen, but mostly because I had far too many other more exciting things I wanted to do! 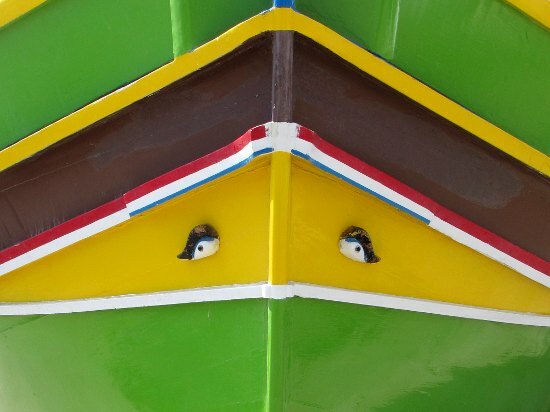 "oh, you must go to Marsaxlokk and see all the fishing boats!" So I did - and indeed the Luzzus are very pretty and photogenic, but there wasn't much else there to see or do! Great if you want to sit by the sea eating fish, but I don't, so I didn't stay for long. I stayed at the Solana hotel in Mellieha. I picked this over one of the 'resort' towns because I wanted to be somewhere a bit quieter and more relaxing. I think I chose well - the hotel was lovely, my room was huge, the restaurant was good, and it wasn't too busy. On Friday morning I visited the WWII air raid shelters - a bit claustrophobic, but interesting none the less. I'd booked a day trip sea kayaking on Gozo with Sea Kayak Malta - because I couldn't quite face the idea of a holiday with no paddling at all We'd originally planned to paddle from Hondoq Bay to Comino (and the Blue Lagoon) but an unexpected road closure meant a last minute change of plans. Instead we headed to Xlendi where we paddled up the coast to Dwejra, through the Azure Window, had lunch by the inland sea, and then paddled back. A more detailed writeup is here. I'd never been sea kayaking before, and despite the boat being a million miles long and so very slow to turn, it was a really good trip. Once we'd finished paddling it was time for another ice cream, then I got dropped off in Victoria and had a wander around before heading back to the ferry. Amazing views over all of Gozo from the top of the citadel. On my first night I did the 'Malta by Night' bus tour. Organised tourism, complete with commentary - I figured the evening tour would be more worthwhile than any of the day time ones, just because it was a bit different. Sitting on top of an opened top bus after sunset does get a bit chilly though - and somewhat windswept! There was an option to include a traditional Maltese meal with the tour which I didn't go for, which left over an hour to explore Mdina. I felt this was far too much time, although by that point I was definitely suffering from only having had about 3 hours sleep the night before. 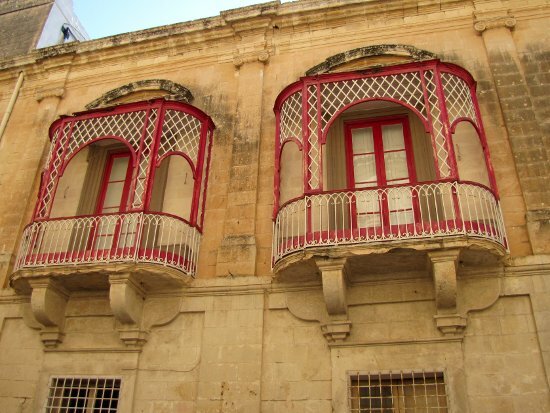 Mdina is known as the "Silent City". Being a tiny medieval walled city there isn't space for traffic, and there are no noisy bars or neon signs. Small signs remind you to respect the peace and quiet of your neighbours. Very peaceful, and especially so at night. Getting around Malta is very cheap if you use the buses. €12 for a seven day ticket, and in theory the buses are regular and reliable. In practise, they're late and overcrowded. Ahh, the joys of public transport! Some of the routes use 'bendy buses' - as previously rejected by London on safety grounds. The Maltese don't seem worried though, and happily throw them around the narrow windy pothole filled roads. Top tip: don't stand on the 'bend', unless you want to fall over every time the bus turns a corner. would you want to drive a bendy bus around this? 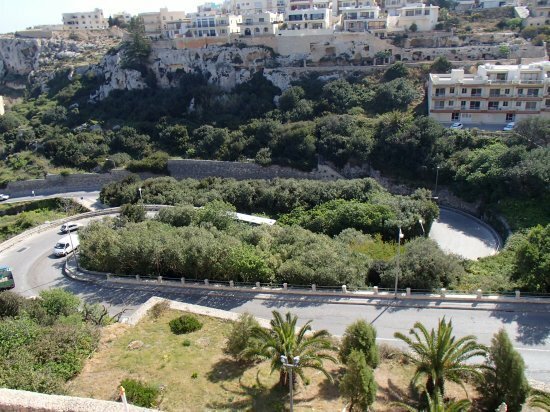 The week's scariest bus journey - from Valletta to Ta' Qali craft centre. The bus was already rammed by the time I got on, but never mind safe passenger numbers - just scream at everyone to move further back and let another 20 people on board! So then it was utter chaos if anyone wanted to get off - a case of getting shoved and groped and having your feet trodden on by rude little old ladies. And how dare I let my bag press against them when I'm trying to let someone else squeeze past. Crazy. I was very glad when I reached my stop. Original vague plan had been to go to Ġgantija on Gozo, but in the end I went to Tarxien. Took quite a bit of wandering around the town to find it, and I'm not convinced it was worth the €6 - you're restricted to walkways which don't actually show you the whole site up close. But it's interesting when you consider just how old these structures are. 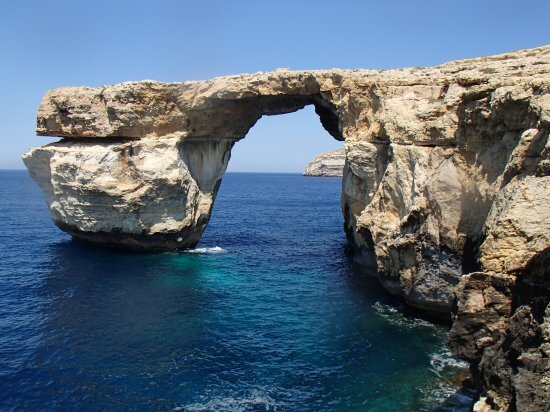 The Blue Grotto is a bit more off the beaten track, on the south side of the island. €7 for the boat tour, where you see more caves, interesting rock formations, and pretty coloured water. Apparently at its best in the morning before the sun gets too high. I went at about 2pm, and it was still very pretty!